I’m a follower of people in the anime industry, but mostly, it’s just the (good) directors I like to keep tabs on. I delve into their works and the more I find, the more I trust in those same people to deliver yet more good anime. Hayao Miyazaki is a popular example, and Masaaki Yuasa is another. 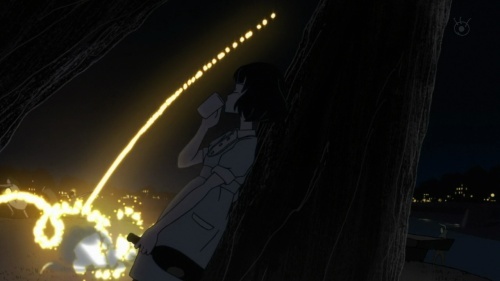 I have faith his talent and I’m happy to sit here, passively, and take whatever he throws at me, which is why I now find myself both fascinated and horrified by some of the reaction to the first episode of The Tatami Galaxy. People complain that it’s impossible to follow because the characters speak too fast, and some are even going so far as to pause the show, line by line, to read every word of dialogue before it zips off the screen. This seems horrifying to me because it’s like stopping, say, Yoko Kanno half-way through performing ‘Tank!‘ and asking her to explain what she just did. I guess what I’m trying to say is, the dialogue is fast for a reason. It’s supposed to be borderline incomprehensible; that was the director’s intent, so, don’t worry about missing a line or two, he wants you to miss them, just let the anime wash over you and try to understand what it wants to say. In the case of The Tatami Galaxy‘s Watashi, he’s a hyper-sensitive and bitter student jaded by, at the same time as desperately chasing, true love; this is not Lelouch Lamperouge or Light Yagami, not every word Watashi utters is supposed to mean something, in fact, most of what he says is either a lie or just flat out irrelevant. I’m starting to think there are two clearly defined ways of watching anime. You either go in ready to work out what you’re seeing, or you just expect to have it spelt out for you. If you’re in the latter’s camp and refuse to budge, you won’t ever get what’s so good about The Tatami Galaxy. I’m trying really hard not to get too carried away into hyperbole this early, but I hope it’s not too much of a stretch to suggest that The Tatami Galaxy has the best first episode of anime I’ve seen for long, long time. I just decided to go and stream it after reading this article and I must say I am impressed with it. The animation style is interesting and engaging, and the dialog is quite intriguing. While I wouldn’t watch this show to learn japanese, as I usually pause and rewind quite often to try and work out phrases and meaning, I would watch this for the entertainment aspect as well as the depth of it. I’ve only seen the first episode so far, but i’m looking to polishing up on the rest of it before the end of the month. Great to hear, ReshenKusaga. This is promising to be a really good series, and the more that see it, the better. While I think the rapid delivery is certainly a creative choice, the fact it is quite so wordy may be due to it being based on a novel. Novel adaptations tend to be wordier but allow that to effect the pacing of the animation. This felt like they took exposition that other shows would spend three episodes on and condensed it to one in order to maintain a faster rhythm. Perhaps, I guess I just can’t see someone like Yuasa adhering so strictly to a novel in that way. It’s mostly just the monologues/narration that have ‘spitfire’ delivery and I got the impression it’s more just supposed to be a reflection of the intensity of Watashi’s self-deluding reasoning, as if he’s speaking/thinking so fast as to avoid having to actually contemplate his reasoning. I’m unsure on this. There were certainly places in the episode which didn’t sound like they were meant to be much more than a stream of words, but I’m not sure just letting it fly by is necessarily the right path. A barrage of comprehensible words has a very different impact from a rapid stream of text onscreen. It’s perhaps slightly perverse that the one time the industry makes an active commitment to quick-subs over the slow production of full DVDs, they’re doing it with a show which would benefit so enormously from a FLCL style fluid dubbing. Tatami Galaxy looks terrific, but I think this is Yuasa moving away from abstraction, it’s fun, but I don’t think we’re seeing it in its best light. The show feels like Yuasa’s crowd-pleaser, and it’s bound to get a lot of talking up, so I think it’s inevitable that some people will be frustrated by its not being easily subbable. Most definitely, a dub would totally alleviate a lot of the problems people seem to be having with the show. Also, it’s interesting that you picked up on the vibe that this could be “Yuasa’s crowd-pleaser,” because I felt exactly the same way, I really think it has the potential to become his best (and most accessible) work and a thoroughly compelling love story. The end was especially fascinating and I can’t wait to see what happens next. I’ve seen comments elsewhere comparing it to ‘Groundhog Day,’ while another suggested that the weird-looking Ozu could be a Tyler Durden-esque creation! I want to watch this! Fast is not bad. Gyagu Manga Biyori was hilarious. And incredibly fast. Sayonara Zetsubou Sensei was fast at times as well. And good, too. I don’t see how fast is bad if you’re reading. Learn to read faster. Or pause the episode if you have to. Or rewatch it. Unless you’re working on understanding spoken Japanese, fast is not bad. I’ll be interested to hear what you think about it after you’ve seen the first episode, this is definitely about as fast as anyone can talk, constantly, for 20 minutes 🙂 And I really need to check out Gyagu Manga Biyori, I love that random sense of humour and play on manners that the Japanese seem to excel at. Funny alt-text on the image there. As i watched the Tatami Galaxy, I was biting back the urge to pop my FLCL DVD’s in right after. Firstly there’s the Code Geass type. the vast majority of mecha fit into this type, but not all. I like to think of this type as the “summer blockbuster” type of anime. There’s nothing wrong with a summer blockbuster, really. They’re technically brilliant – the color palette is lear and bright, the lines crisp, framerate high and effects used for big explosions and fights. This type of anime is undoubtedly good, in my opinion: it’s highly entertaining and engaging to the viewer. You can’t help but feel excited when watching Code Geass, it’s too much of a thrill ride to not. If this type of anime is shittily produced, however – the Bleach anime comes to mind – this all turns to dust. The act of animation is at the forefront here, and that’s not a bad thing; animation is a lovely thing. The second type is the Tatami Galaxy type of anime; the “cult classic” if you will. These anime are sometimes not amusing – but if you asked yourself the question “Could I have lived without seeing this?” the answer is almost certainly no; because the process of watching the anime changes the way you see the world. While they may employ some of the same visual techniques as the first type of anime – in terms of color palette and animation style – often they don’t, and either way it doesn’t really matter, because it isn’t the act of animation that’s at the forefront but of narrative. *or movies, or books, or any cultural product, i think. in fact, this two-types-of-anime business actually arose when I was talking about movies to a friend. I think that’s a really insightful comment, Celeste, as ever. I particularly liked your idea that “the process of watching the anime changes the way you see the world,” because that’s exactly how it has affected me, really, especially compared to before I’d discovered this lovely medium; I’m sure I contemplate things more now, I’m more in touch with my heart, if that makes any sense.